On Monday Truecaller launched “Truecaller Backup” feature for Android Smartphones which allows users to backup and restore their contacts to Google Drive.”Truecaller Backup” has been one of the most requested features by its users and will simplify a user’s transition to a new phone or SIM card by securely backing-up their contacts and settings and stored on your Google Drive,” the company said in there statement. Now The backup file will only available for Google Drive users to start with but this feature will be expanded to other backup storage in future as per the company Decision. 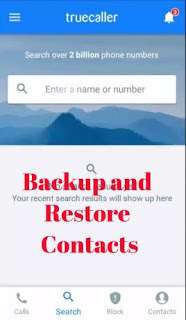 Users can also customise backup frequency too from daily, weekly, monthly and as per the users demand.The upgrade also enables recovery of lost data from Google Drive which the app can easily restore to its last saved state.Additionally, the app has also released another good feature which called “Truecaller Contacts”. Using this feature users search for any contacts whose details they have not been saved in there phone but they have previously communicated with that user. This feature contains all the contacts users have called or texted them which makes it for them to recall them and communicate with temporary contacts without saving them in their phonebook too.